Life Is A Journey – The Sardinia Tapes is an extraordinary studio album, one which blurs the boundaries between progressive rock, modern jazz and contemporary world music. By definition, this could be instrumental progressive music, however, one listening worth more than any categorization – try it, possibly on a high-end gear. The special studio album finally came out on October 6, 2017, via British Cherry Red in CD + DVD format. Life Is A Journey premiering a few days before, in the Richter Room, in Győr, on October 3, and in MOMkult, in Budapest, on October 4 in Hungary. These gigs were performed not only by the quintet who recorded Sardinia Tapes: besides Steve Hackett and Gulli Briem, the full Djabe line-up was present – so, a special, 7-member line-up performed at the premiere. 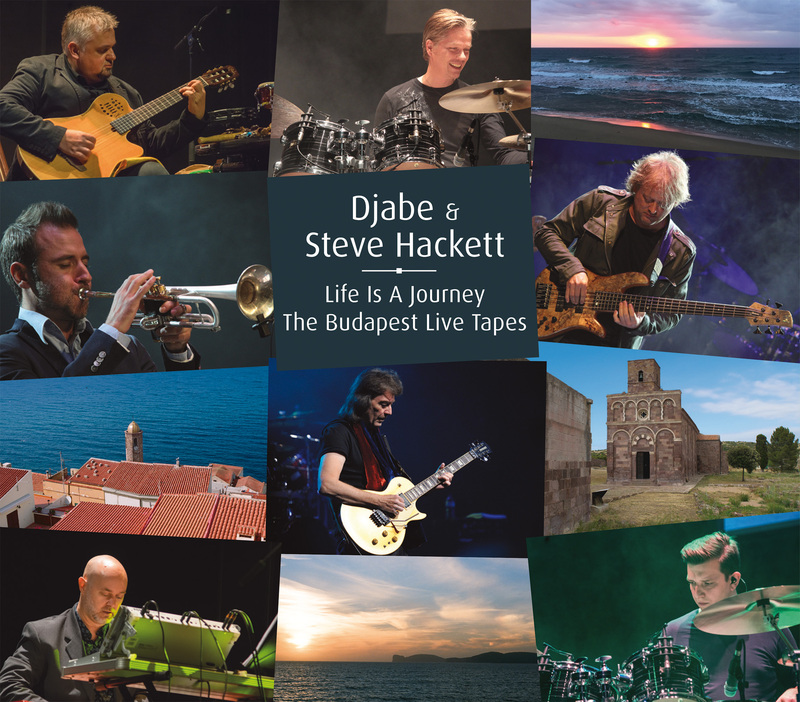 The MOMkult gig was recorded, and this material served as basis for Life Is A Journey – The Budapest Live Tapes, a 3-disc monstre concert album, set for release on September 28, 2018. The 90-min Life Is A Journey – The Budapest Live Tapes can be sliced in 3 separate blocks. The first 30 minutes of the DVD and CD the current Djabe line-up can be seen and heard. Tamás Barabás (bass guitar), Attila Égerházi (guitar), Péter Kaszás (drum), Áron Koós-Hutás (wind) and János „Jancsa” Nagy (keyboards) performs pieces from Forward (2014) and 20 Dimensions (2016), since matured to being classics on stages of international jazz festivals. The line-up plays these popular pieces by its own sounding and perception. Interesting to know that in the intro of Life Spirit, the main theme of Witchi Tai To was inserted by Attila. Tamás Barabás’s current bass guitar- piece was christened Busy Butterfly. At the start of the second block, drummer Gulli Briem and guitarist Steve Hackett was asked to step on stage, and all 7 resumed the performance. The following 30-ish minutes featured Steve Hackett and Genesis songs made Djabe-like. Los Endos, Fly On The Windshield, Please Don’t Touch, Firth Of Fifth and Last Train To Istanbul all extended to extra dimensions by Gulli and Djabe. Following all this, on the CD2, and second half of the DVD the premiere of the improvised Sardinia records can be seen and heard. The 3rd block contains 4 long Life Is A Journey compositions, altogether 35 mins. The guys never held back variation and improvisation wise, but the things they did to pieces originally made by impro and jamming sessions in live, that is hard to describe without superlatives. All in all, it can be said this is the only way to touch something basically good, in itself outstanding, or rather: genius. Golden Sand gained some: on Sardinia Tapes it was „only” 7 mins long, but on The Budapest Live Tapes it is 11. Turn your focus towards Jancsa Nagy’s gorgeous extra keyboard parts, but a fine ear can hear new bits in Steve’s guitar and Áron’s trumpet, too. Buzzy Island, already twirling with the studio version, just became even more crazy live. The concert version gained 2 mins you never notice because it takes you away. Steve virtually plays something completely different (and not at the same spot, either) than we grown used to on Sardinia Tapes, however, this is not the least disturbing, but rather interestingly, being a perfect fit for the well-known theme. Interestingly, the – now doubly so – title piece changed the least live. The middle riff, as a highlighted central theme makes it different, more rock-like, urban-like altogether, compared to the original Mediterranean version. More so, featuring Péter Kaszás along Tamás Barabás in the Life Is A Journey vocal made it even better. The also extended After Limoncello is more dynamic than the original from Sardinia. Keyboards deliver a jazzier, saloon-like feel to this outstanding piece, with a rockier guitar, foxier bass, raised tempo and more separated solos. Altogether, the gig version is more like sitting in a café, or walking on a pedestrian only road in the early afternoon, with ideal proportions, instead of the original’s seaside gazing, yearning for the Mediterranean. This should be a yardstick! Before the extras, differing by format, we can listen to Clouds Dance, a piece that changed much since New Dimensions Update Live, when the new Djabe line-up stepped on stage for the first time. Not just the minutes it gained, but a more courageous jamming and improvisation parade made it to the main themes, and Steve plays the guitar like a genius, too. So, when the tonally exceptional Fernandes comes, we’re in for an instant change from world music to progressive rock. Basically, the Clouds Dance on The Budapest Live Tapes is more akin to the records made at the It Is Never The Same Twice gig (Ady Endre House of Culture, Miskolc, and Budapest Jazz Club), but as „it is never the same gig twice”, it can surprise even those who have all the previous releases of Djabe & Steve Hackett. For example, this time no vocal bank can be heard on the synth, while we can enjoy solos widely differing from previous versions. In June 2018 7 cities and 3 countries were travelled by Djabe. At the first five stops, Steve Hackett and Gulli Briem both performed, while on the last two only Gulli stepped on stage. Accordingly, the first 5 gigs (Prague, Budapest, Wien, Sankt Veit an der Glan, Kaposvár) heavily featured the fresh compositions from Life Is A Journey – The Sardinia Tapes, besides the classics of It Is Never The Same Twice. The last 2 gigs (Szeged, Miskolc) put the emphasis on Flow. The peak of this week-long tour was the Wien gig, where unimaginable energies released. Solos, even more inventive than usually, improvisations, and a memorable harmonica blues variation from Steve, in the extended version of Distant Dance. Bits of this intensive summer tour made it to the extras of Life Is A Journey- The Budapest Tapes (2018). At the end of the content of the double CDs, we find two recordings of the It Is Never The Same Twice tour, one from Prague (The Steppes) and one from Kaposvár (Distant Dance). Interesting to know that, after the Wien gig, the harmonica once again starred in Kaposvár, so one more audience could experience a memorable extra performance, now a part of the concert album’s bonus material. DVD extras contain the Tour Is A Journey, a documentary-style video diary, which brings the stages of Lucerna (Prague), Barba Negra Track (Budapest), Reigen Live (Wien), Castle Herzogburg (Sankt Veit an der Glan) and Somogy Wine Festival (Kaposvár) to the homes of the fans. This diary shows not just the gigs but the organization before them, Stage set and sound checks shoots, while the live video bits tells us about the great atmosphere. Under the whole documentary, the special compositions of Life Is A Journey – The Sardinia Tapes can be heard, bringing a kind of extended experience, showing all the known details from a different perspective. The only odd one out is Distant Dance, but it would have been a crime to leave it out. The DVD’s two extra clips also are tied to Life Is A Journey – The Sardinia Tapes. The Life Is A Journey screen film was made in Sardinia, just like the studio album that plays under it. On live performances we can find some of the background projections familiar, as the Sardo Moments short film from the Sardinia Tapes DVD serves as a basis for them; a rethought, extended version, perfectly complementing the flowing music. The video clip of Beams Over The Nulvi Mountains is a first to be featured on an official release. These beautiful, fitting video records were made by Attila Égerházi, with the use of a Super 8 camera. The magnificent wind turbines on Sardinia, captured in various light conditions complement these extraordinary videos perfectly. In a perfect world, a shower of awards would be the reward for an artistic value of this magnitude. Hopefully, along the fans, the industry pros will also realize how perfect a gem just been released by Djabe.